If you asked me earlier in the week what I did back on Aug. 23, 1991, I would've answered, "I have absolutely no idea." Today, though, I know exactly what I did on that date: I, along with my older brother and our parents, waltzed into the local Toys R Us (or Shopko, or Kohl's--I can't remember this particular detail) and bought a Super Nintendo Entertainment System. It was the first game system I ever got the day it came out, by the way. Previously--with the NES, TurboGrafx-16 and GameBoy--I waited months or even years before jumping on board. There was no way my brother and I were going to wait for the SNES, though. Both of us had followed the console's development and Japanese release like our lives depended on it, so we did whatever we had to do to ensure we'd be able to nab Nintendo's second system the minute it was available. On the flip side, it allowed us to get our hands on a SNES and a copy of Super Mario World pronto, so at the time the sacrifice seemed acceptable. I still have that SNES, by the way. I also still have a handful of the carts my brother and I accumulated in the years that followed the console's debut--Final Fantasy II, Final Fantasy III and Yoshi's Island among them. Speaking of which, none of those games are discussed in this nostalgia-filled post that's supposed to celebrate the SNES' 25th anniversary. Also ignored here: A Link to the Past, EarthBound, Super Mario Kart and Super Metroid. That's not because I dislike any of those classic games, mind you. On the contrary, I dearly love each and every one of them. No, the reason I'm not devoting any space to them is they're honored all the time (and rightfully so) for their greatness. What does that leave? It leaves the following nine SNES titles, all of which are near and dear to my heart, and all of which did a stupendous job of showing what Nintendo's entry in the 16-bit game-system wars was capable of when the right people were involved. ActRaiser--I still remember my initial reaction to this early SNES game. Teenage me thought it was so beautiful that someone at developer Quintet must have sold his or her soul to create such brilliance. Do I feel that way today about this ambitious title, which dares to combine the action-platformer and city-building genres? Yes and no. 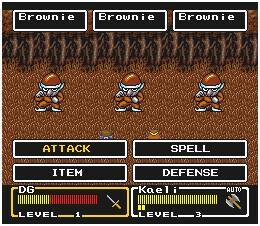 On the positive side, ActRaiser's looks still bring tears to my eyes. I also continue to appreciate some of its bold gameplay choices. 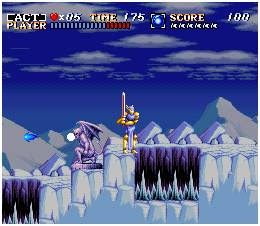 On the negative side, though, I find the side-scrolling sections to be a bit stiff and unforgiving these days. Oh, well, as they say: two out of three ain't bad. Final Fantasy Mystic Quest--Unlike ActRaiser, this Final Fantasy spin-off (in Japan it was called Final Fantasy USA) didn't immediately trip my trigger. In fact, I turned my nose up at it for a good long while. What changed? I rented it one weekend when no other game appealed to me. What I discovered during the ensuing two days was that, while the game strays far from the traditional Final Fantasy fold, it does so in some really interesting ways. (Much like Square's Mana and SaGa series.) I especially like the rock-leaning soundtrack conjured up by Ryuji Sasai and Yasuhiro Kawakami. 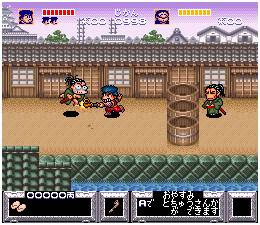 The Legend of the Mystical Ninja--It's kind of hard to believe this game, part of Konami's long-running Goemon series, made the trip across the pond when it did. At the time, most "wacky Japanese" titles stayed put in their countries of origin. Thankfully, the higher-ups at the company that Castlevania built took a chance on this one. It's still one of the system's best looking and sounding games, in my opinion--despite the fact that it's one of its earlier offerings. Pocky & Rocky--Here's another unconventional game (according to Western tastes, at least) that a company had to take a chance on and that immediately appealed to me. I've got to say that I like this scrolling shooter, which actually is a sequel to Taito's KiKi KaiKai, a bit more than the action-adventure title mentioned above. Every single aspect of it is spot-on--a fact that explains why even loose copies of it tend to go for shy-high prices on both sides of the globe. 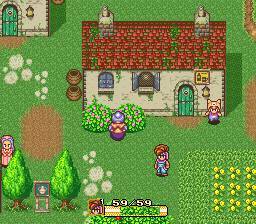 Secret of Mana--I know it's now popular to poo-poo this action RPG, but I love it. Always have, always will. 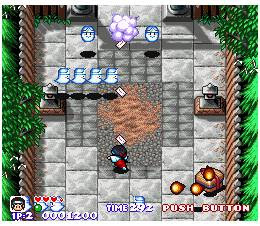 Granted, you're talking to someone who gleefully ogled early screenshots of this "real-time Final Fantasy" for what seemed like ages before it finally saw the light of day. Plus, for me, its still-stunning aesthetics and wide variety of weaponry trump any of its gameplay or performance niggles. 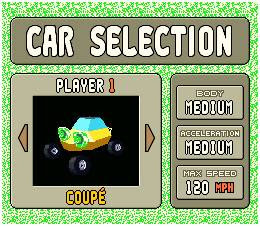 Stunt Race FX--Did Nintendo's first Super FX title, Star Fox, blow me away upon it release in early 1993? You bet it did. To be honest, though, this second such game blew me away even more. That's likely because Stunt Race FX's genre and graphical stylings are more my cup of tea than those of its rail-shooter counterpart. Sadly, it's harder to ignore this game's big flaws--a pitifully low frame rate and a slow overall speed--these days than when it first hit store shelves. Even so, I continue to take it for a spin now and then just to bask in its goofy, googly-eyed glow. 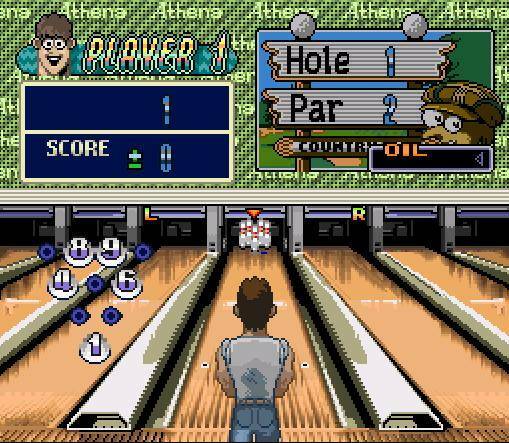 Super Bowling--Although no one's likely to call this KID-made sports cart one of the SNES' best offerings, that doesn't mean it's not one of its most enjoyable--especially if you're in the mood for a multi-player romp. There's not a ton of depth here, admittedly, but the various characters, as well as ball, lane and gameplay options, provide more than enough content--not to mention fun--to make the price of admission worthwhile if the idea of a digital bowling title sounds interesting to you. 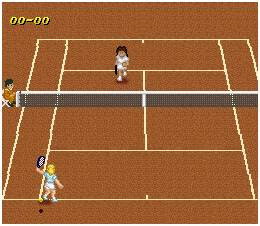 Super Tennis--This is one of a handful of video games produced by Japanese textbook publisher Tokyo Shoseki, so you might assume it's a bit of a turd. In reality, it's one of the best tennis titles ever created. It's not the most realistic, mind you, but it controls so well and feels so smooth that only the biggest tennis snobs will care. My only complaint: after you've spent a good amount of time with it, you'll be able to pick off most of the computer-controlled opponents with ease. Zombies Ate My Neighbors--My brother, friends and I put an ungodly amount of time into this cartoonish run-and-gunner back in the day. That's the only way to play Zombie Ate My Neighbors, by the way--with another person sitting by your side. 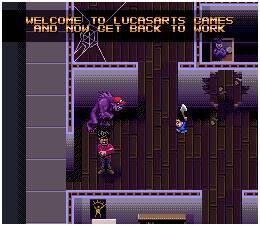 Which is too bad, in a way, as the designers and developers at LucasArts did a bang-up job on the game's controls, music, looks and even humor. The fact is, though, it's just not much fun if you go it alone. So, be sure to grab a pal or lover--or both--before you boot it up to get the best experience.